Shawn and Rus at one of his Hoops for Peace events. Photo by Michael James. Shawn Harrington, a former stand-out player at Marshall High School on Chicago’s West Side, did everything right and still ended up a victim of Chicago’s gun violence. He first came to the attention of the public as a bit player in Steve James’ documentary, “Hoop Dreams,” which followed two basketball players from Chicago’s West Side from eighth grade through high school — William Gates, who played at St. Joseph in suburban Westchester and Arthur Agee, who started at St. Joseph’s but transferred to Marshall, where Harrington was a teammate on the 1991 team that finished third in Illinois. After graduating from Marshall, Harrington went to a few colleges to play basketball, became a Division II All-American and got his degree before returning to Chicago to raise his daughter and become an assistant basketball coach at his high school alma mater. Run Bradburd, who at one time ran a scouting service and knew Harrington when he played at Marshall, ultimately became an assistant professor and assistant basketball coach at New Mexico State and recruited Harrington from a junior college. But Harrington left New Mexico State after a year, and the two men lost touch for 20 years. It wasn’t until Harrington was shot in a case of mistaken identity while driving his daughter to school in 2014, leaving him paralyzed from the waist-down, that the men connected again. Bradburd, who still teaches writing classes in New Mexico State’s MFA program, lives in his hometown of Chicago during the summers. It was in Chicago where the two men rekindled their relationship, with Bradburd initially trying to get others to write about Harrington’s story in order to help him earn money for his medical expenses. After a couple reporters wrote stories, Bradburd was starting to hit a wall, until meeting with writer Alex Kotlowitz. Bradburd went into the meeting thinking Kotlowitz, the renowned writer of “There Are No Children Here” would be a great person to write about Harrington, but left convinced by the writer that it was he who should tell Harrington’s story. As indicated in the book’s sub-title, Bradburd couldn’t tell Harrington’s story without telling the story of what’s been happening on the West Side and specifically at Marshall, where in the last four years, six Marshall players have been killed and two (including Harrington) have been shot and paralyzed. 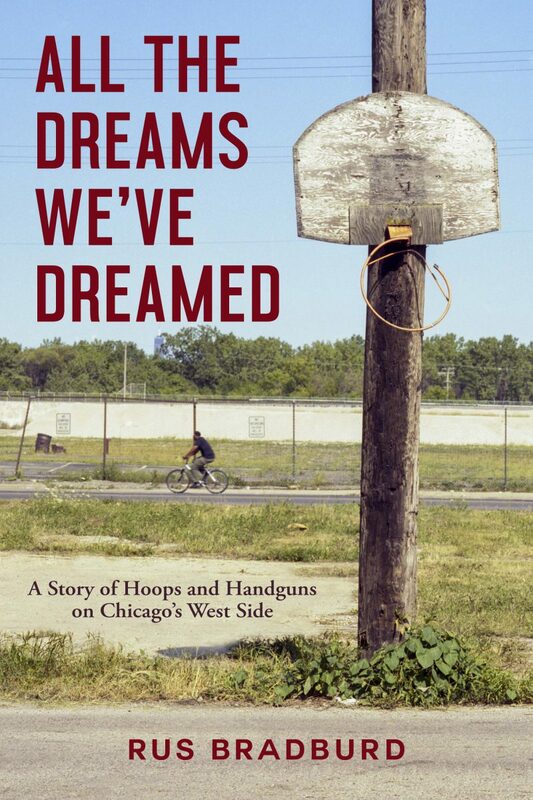 And it hasn’t stopped — since the book was released, another former player, 19-year-old Cedric Williams was killed May 19, making it seven players killed in four years at one high school on Chicago’s West Side. The Chicago Ambassador’s Bob Chiarito recently spoke to Bradburd about his book and the violence that continues to plague Chicago. 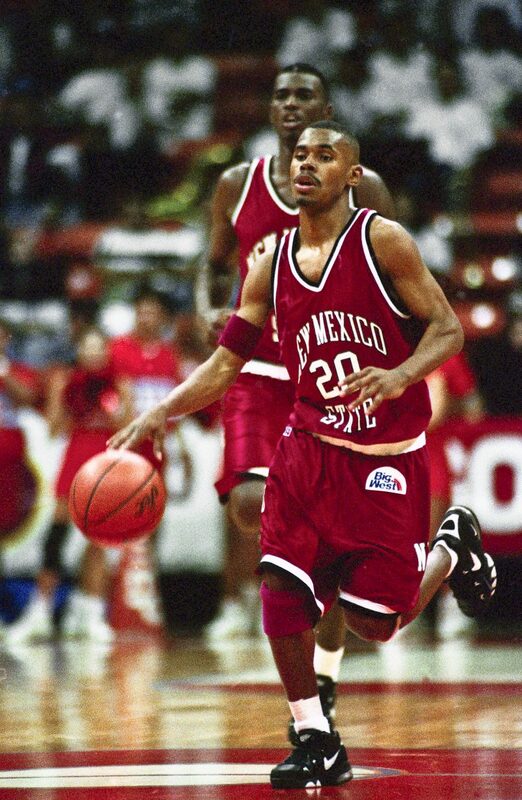 Shawn Harrington in 1995 playing for New Mexico State. Photo by Dennis Daily. CA) I read the book. It’s a great story, but obviously not a feel-good story. You knew Shawn and then drifted apart for a long time before connecting again after he got shot, right? BRADBURD) Yeah, I was out of touch with him for twenty years. I spoke to him when his mother was murdered but hadn’t seen him in twenty years. CA) After you reconnected, you tried to help him get him a job by calling in favors and that sort of thing. Then, you pressed Alex Kotlowitz to write about him but he ended up convincing you to tell the story on your own? BRADBURD) That’s right. I had the idea that an article by Alex would help get us more publicity to help raise money for Shawn’s medical expenses. I got some people to write magazine articles, but not everyone is going to take my advice on what makes a good piece. It got more and more frustrating and then Kotlowitz said ‘Why don’t you write it yourself?’ I think it was a deal where I think I knew it all along but wasn’t ready to admit. It was sort of my story to tell but it just took a long time for me to admit that to myself. CA) Did you ask Shawn about it before you started? BRADBURD) I did. I think to him, if you haven’t had a book written about you and you don’t know writers and aren’t around the literary world, I’m not sure it quite registered. I wasn’t taking notes every time I was with him and wasn’t always interviewing him. I was hanging out and would take notes and write my impressions afterwards, along with things to follow-up on. Also, he’s like a lot of people. Sometimes people can’t tell their own stories. I had to really poke around to learn things. I remember when I wrote the Nolan Richardson book, I was nearly done with it when I learned that he desegregated the University of Texas El Paso and ended the Jim Crow laws. I was like, ‘Why didn’t you tell me that?’ and he said that he thought I knew. It was an important part of the story and it almost didn’t make it into the book. Of course, if you read the book you wouldn’t know that but it almost didn’t make it. It was the same with Shawn. There were important things and threads but often the person being written about doesn’t see that and the writer needs to be able to pick up on. CA) How did you come up with the title of the book? BRADBURD) It’s from the Langston Hughes poem “Let America Be America Again.” The poem is sort of a conversation, which is what I hope the book is. To me, the book is a conversation between Shawn and I and me and myself. The idea for the book, like any book, is to take readers to a world that they don’t know. I think most of the people reading the book are not West Side gun victims. CA) For people who haven’t read it yet, it’s more than the Shawn Harrington story. It’s really the story of Marshall and what’s been happening on the West Side over the last few years. Was it intended to be more about him at first and you expanded the story? How did that happen? BRADBURD) Exactly. The writer Grace Bailey said that she doesn’t feel like she has a story until she has two stories, and I think that’s what happened here. I started writing about Shawn Harrington and then Tim Triplett got killed. The more research I did, it was astounding. He had a lot of similarities to Shawn. Shawn was a guy who did everything right and got shot. Triplett was a guy who made a lot of dumb mistakes and paid for it with his life. But they were very similar. Triplett’s father was killed, Shawn’s mother was killed. They were both point guards and very boisterous. They both would have had to play at junior colleges to get to four-year schools. With Shawn flat on his back [after he was shot], he couldn’t help Triplett find a school and gotten out of town. I think Shawn would have helped him find a school and get out of town had he not been incapacitated. But yeah, it started with the Shawn Harrington story but spiraled. It was hard to keep the book under control as more and more players got killed. I had to keep it down and keep the focus on Shawn or it would have been a 600-page book. CA) It’s been 7 players killed in 4 years, right? BRADBURD) It was 6 and then Cedric Williams was killed three weeks ago [May 19], after the book was out, to make it 7. CA) And that’s just guys who played for Marshall, that’s not counting all the other students? BRADBURD) That’s right, and it doesn’t count Martin Satterfield, who is a wheelchair for life like Shawn. CA) So the “Hooper’s pass” that may have existed is totally out the window? BRADBURD) I think so, but even back then, there was a lot of truth to it but it wasn’t a hard and fast rule. Ben Wilson was killed in 1984 and didn’t get the pass. Even in the movie Hoop Dreams, Arthur Agee got robbed at gunpoint at the end of the movie. Shawn had been robbed at gunpoint in 1991 or 1992. So, it’s not like they were totally immune before but the difference now is that they put a lot of the older gang guys in prison so now the 16-year-olds are in charge. Two days ago, the Chicago Tribune reported that 60 percent of the arrests in Chicago this year have been of African-American teenagers. It’s just kids going wild on the streets. CA) I used to cover shootings and homicides in the 1990s and sometimes it seems that nothing has changed. BRADBURD) Well, statistically murders are down. When your grandfather got shot in the toe in World War I he bled out on the battlefield and died. Now, a guy like Martin Satherfield takes six shots, two to the face, and lives. Ben Wilson died on the operating table but waited three hours for a doctor. That lawsuit changed a lot. Now there are trauma units everywhere. CA) Although, on the South Side, the first trauma unit just opened a month ago at The University of Chicago. Up until then, anyone shot on the South Side was taken to Christ Hospital in Oak Lawn or Cook County Hospital on the West Side. CA) I think a lot of people have heard about Shawn Harrington but most probably don’t know anything about the others that you wrote about. Yet, if this was 6 or 7 players from New Trier shot in 3 years, it would be national news, don’t you think? BRADBURD) Yeah. But it wouldn’t be allowed to happen if it was kids from Evanston or New Trier. Race is a big part of it, but so is class. These are poor black kids that are being killed. Part of what happens in the book is that if you or I have our car stolen, it’s an inconvenience. But for Shawn Harrington, it’s a way to get almost killed. He ends up paralyzed because of the stolen car. CA) And you’ve noted that there have been no arrests in any of the 7 homicide cases. BRADBURD) No one has been arrested to my knowledge in any of those cases. CA) I know it’s way past any statute of limitations for him to sue the police department, but does he have any belief that by yanking him out of the car by his collar after he was shot they worsened his injury? BRADBURD) That was my question, and I think he would have won a lot of money in a lawsuit. But he’s never had any interest in suing anybody, which is something that’s remarkable about him. I talked to half a dozen lawyers and heard the same thing repeatedly. That there was a six-month statute of limitations on suing the police and by that time, 18 months had passed. It would be difficult to prove but you could get an expert on the witness stand to say jerking a guy with a spinal cord injury is a bad thing to do. CA) Perhaps he could have gotten a settlement from the police. BRADBURD) Yeah, but for the most part the police did a great job. They got the shooters pretty quickly, and they were convicted and received 59 years. I know the police are not perfect, but there are a lot of changes that need to be made. I didn’t talk about this in the book but there used to be 5 police Areas and now there are 3. So, let’s say you were a Realtor in Naperville and knew Naperville well. Now you’ve been moved to Rogers Park. So, they have re-arranged things and put cops in areas where they don’t know anyone. It’s a combination of things. Between social media, arresting the gang leaders, knocking down public housing, the craziness of the gun laws, the bad economy. You know, 80 percent of the kids on the West Side don’t go to their neighborhood school. They are bused to another area, which also is a bad idea. CA) One of the things that I heard you say is that you don’t offer any solutions in the book because it would have been too long and you aren’t a social expert. BRADBURD) What I’m an expert on is Shawn Harrington and Marshall High School. There are people who have dedicated their lives to stopping gun violence and helping kids on the West Side. I haven’t dedicated my life to it. I think the teachers and the social workers are the heroes. I don’t know what the solution is, but I think it’s complicated. The only thing I know that as a writer – Shawn did not know that Tim’s father was killed and Tim did not know Shawn’s mother was killed, and it’s my impulse to talk about it. I think until we talk about it and tell our stories… There’s a power in that and it helps you to relate to people. You’d think they’d be talking about it all the time but I don’t think that’s true. CA) Maybe when you live in that environment, you probably get tired of it and don’t want to talk about it anymore. CA) It does sound like that’s one of your goals, to get people talking about what’s going on in Chicago, especially on the West Side. BRADBURD) Yes, I hope so.